Plastic Omnium Zarnor applications with limited space availability, Plibac lifting container has two side handles located outside parts that allow for locking and unlocking of the unit. Designed to offer the advantages of a traditional wheeled container, this unit features a front handling lip used to adjust to conventional types of lifting devices. The front handling lip is said to be adaptable to all the usual types of container lifting devices. The container folds to eight in. deep in limited space applications. The lid opening has a handgrip around the edges for increased ease in moving the product. 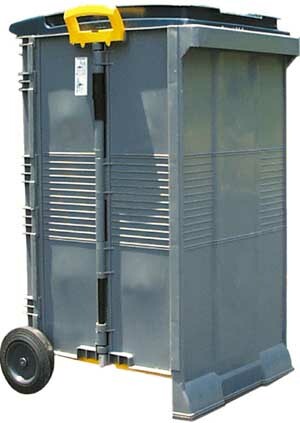 This unit can be used for apartments, condos, row houses, restaurants, and businesses.